Quilts hang in a jiffy, from 9" to 124" wide. Call us if you need a wider width. No-drilling, no math, and quilt will be perfectly placed on your wall. 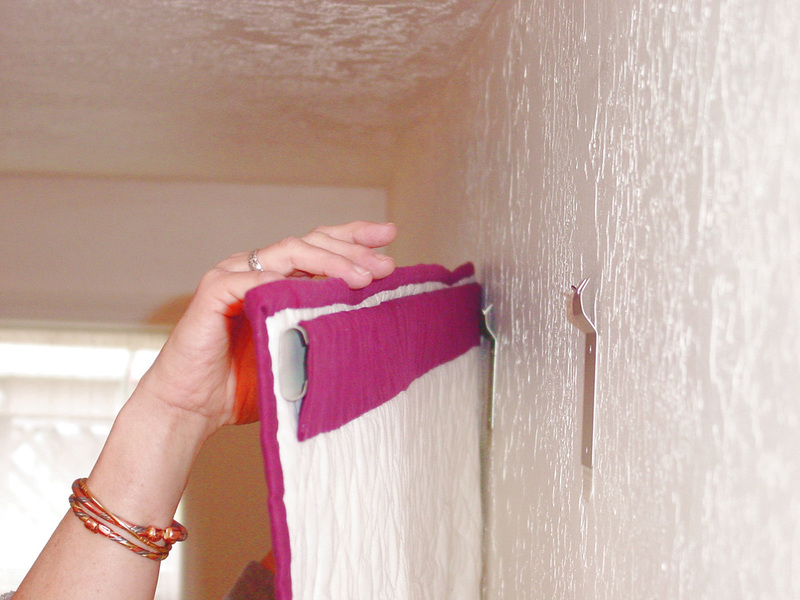 Hanging with 3M Command™ strips means no marks or holes in your wall. You can change and hang different sizes of quilts using the same wall brackets. Made of architectural steel used for roofing and gutters. Archival finish. Bars slide through quilt sleeve and rest on bracket tabs. No special modification of sleeves needed. Wall brackets are made of pressed aluminum. 3M Command™ adhesive strips may be used to hang brackets on most home walls. Brackets have holes for optional screws. 3M Command™ strips may be easily removed, without leaving marks on a wall. 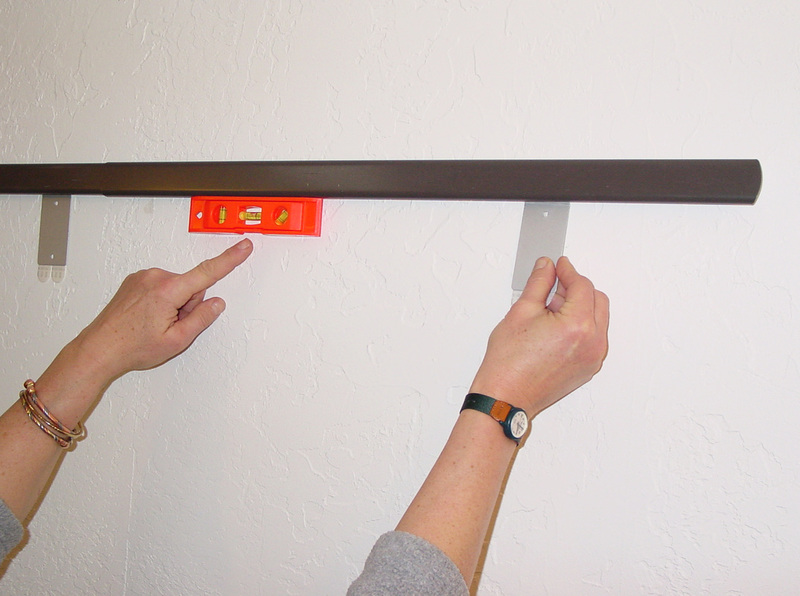 Magnetic level allows a single person to easily level the bars and properly place brackets. Quilt rests on bracket tabs. How do the invisible wall hangers work? 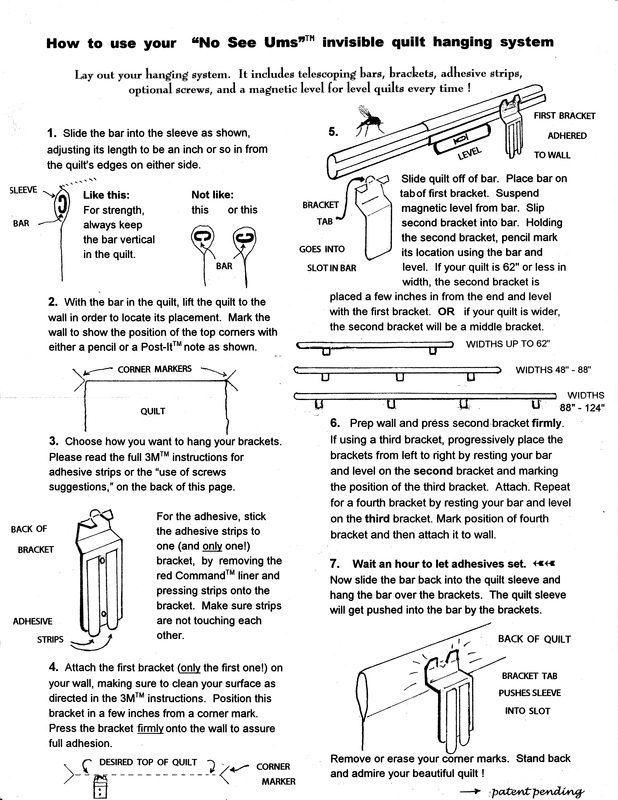 In brief: (1) the first bracket is placed on the wall on the left side, in a few inches from desired left edge of quilt; (2) subsequent brackets are placed moving right-ward using the bar and magnetic level to create a level line; (3) the bar is inserted into the quilt sleeve and the quilt is placed on the bracket tabs. Read full instructions here. User places magnetic level on bar and uses the second bracket to adjust bar until level. Adhesives are then pressed against the wall to hold the second bracket. Bar in sleeve. Flat side faces quilt and slot faces wall. 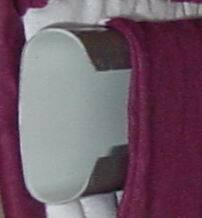 Close-up of wall bracket, with tab on which rests the bar and which is adhered using 3M™ adhesive strips. Back of quilt and back of wall bracket view. Specially designed bracket tab pushes a bit of sleeve into the bar slot as the quilt rests on the bracket. "No See Ums"™ invisible quilt hanger kits contain everything needed to hang your quilt, including telescoping bars, the correct number of brackets for your width quilt, 3M Command™ strips enough to hang twice, optional screws, and a magnetic level. Check sizes and choose yours now. Do you need a quilt sleeve? Try this pre-sewn sleeve. 108" quilt sleeve is industry standard of 4" wide, with a small pleat to give a totally flat look from the front. Available in natural or black muslin. Simply cut to length and sew on the back of your quilt. ﻿﻿Shop now﻿﻿ at the secure Hang-Ups Company store. This variation uses two specialized screws for holding in sheetrock, also called drywall (that's instead of the brackets and Command strips described above for "No See Ums"™ invisible hangers). 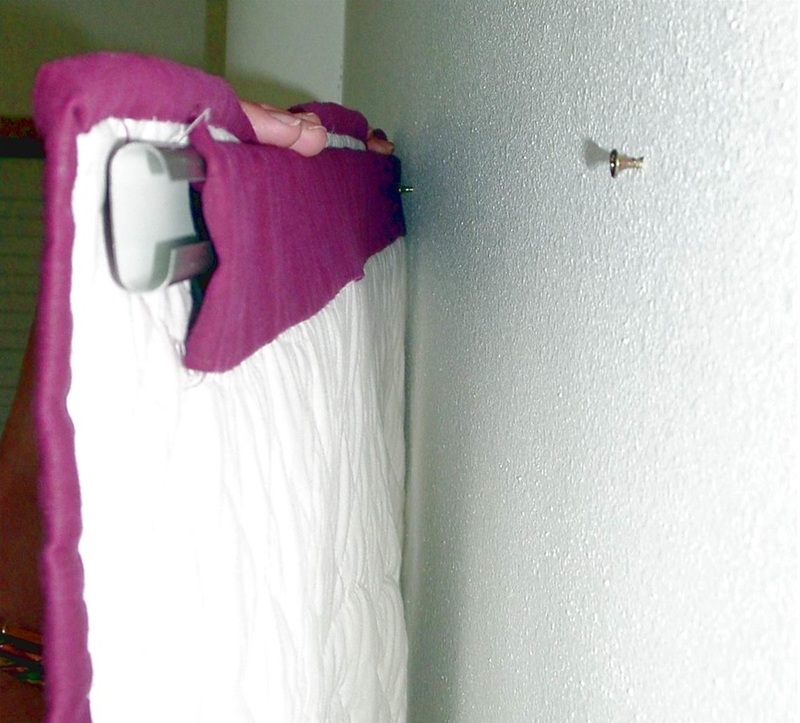 There is no need to locate studs, as these screws are totally adequate for the weight of quilts. Sizes are available up to 88" in width. 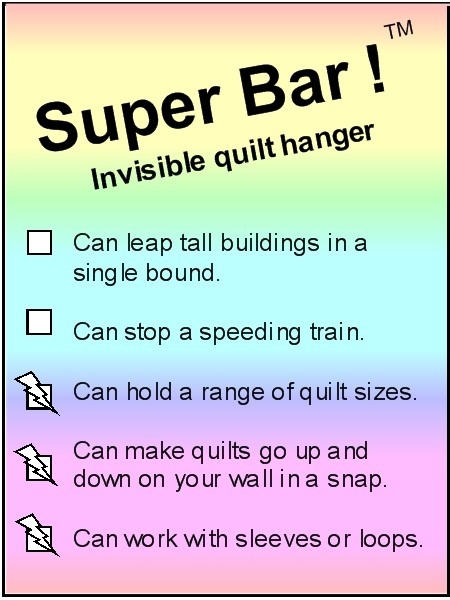 SuperBars!™ invisible quilt hangers for walls. Buy some Super Bars! invisible quilt hangers now. Click on me to hop on over to the Shop Hop Bunny. 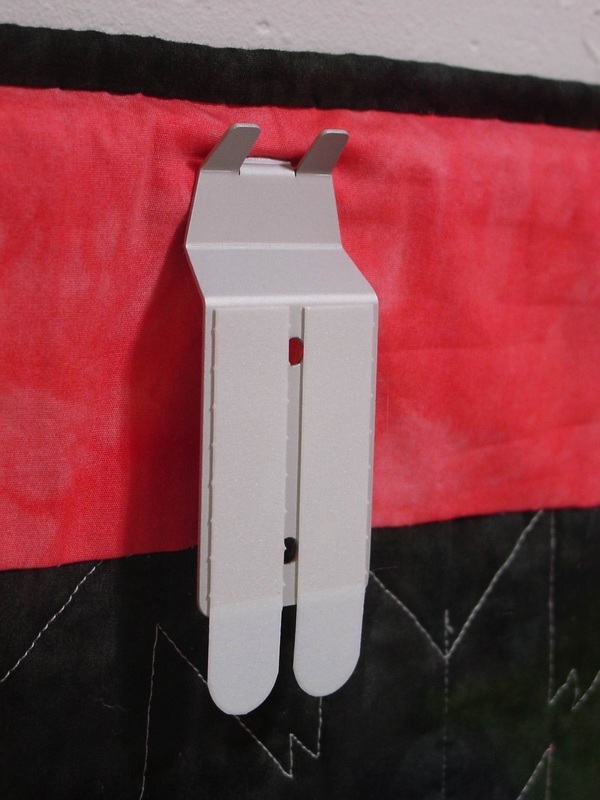 It is checking out all the sizes of invisible NoSeeUms™ quilt hangers for your walls !